Improving the lives of women and teenagers in Anne Arundel County with wrapping paper and bows, the Junior League of Annapolis, Inc. (JLA), is set to kick-off its annual holiday fundraising effort at the Westfield Annapolis Mall. 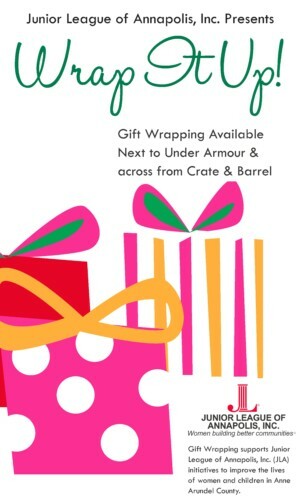 Located in Crate & Barrel court between Under Armour and Lord and Taylor, JLA members will staff a gift wrapping location from Saturday, Dec. 1, until Monday, Dec. 24 during mall hours. All donations made at the gift wrap station will go back to the community and help JLA improve the lives of women and teenagers through their outreach and volunteer programs. Currently, Junior League of Annapolis is focusing on support to Sarah’s House in Anne Arundel County and the Center of Help in Annapolis. For Sarah’s House, Junior League members provide programming that focuses on developing life skills to help increase the chances of success for women once they leave Sarah’s House. With the Center of Help, Junior League members have developed a homework help program called “Helping Hands.” They work with the Spanish-speaking children at the center to practice English, provide homework help, and take field trips in and around Annapolis. Junior League of Annapolis is an organization of women committed to voluntarism, developing the potential of women and improving the community through the effective action and leadership of trained volunteers. Its purpose is exclusively educational and charitable.